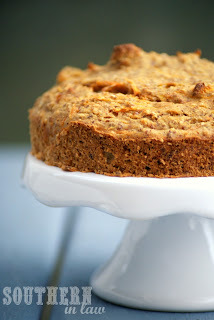 I'm a huge carrot cake fan - always have been. I don't know what it is about it, I just love it. Carrot cake is one of those faux healthy cakes - they get you with the carrot. You're thinking "carrots? well that's got to be better than chocolate cake!" ....not necessarily. 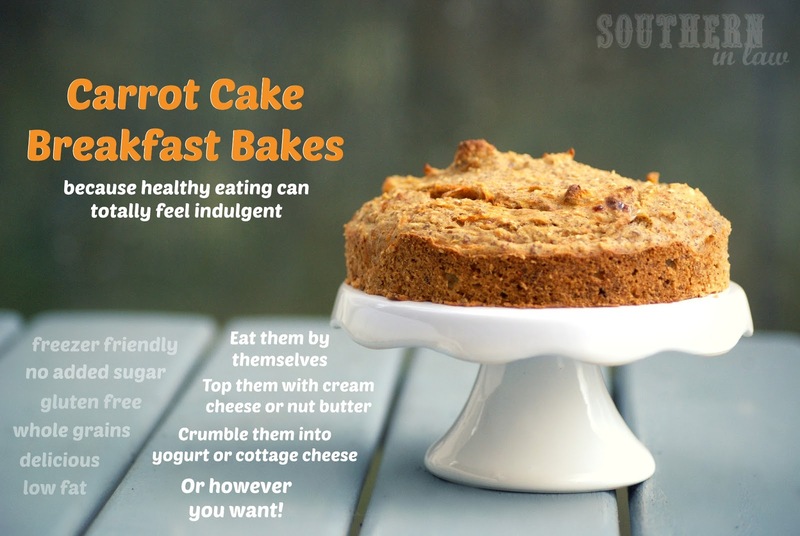 This carrot cake breakfast cake, however, is completely healthy - so you can eat it for breakfast! As you may already know, I'm obsessed with breakfast bakes at the moment - so it was only natural I created a carrot cake breakfast bake! I love these bakes topped with cream cheese (mixed with a dash of maple syrup for extra flavour) with a sprinkle of walnuts mixed into the batter. Heaven. Trust me, you'll feel like you're eating the most indulgent breakfast when it is completely and utterly healthy. This is one of those breakfasts where I turn to Jesse and say "shucks, healthy eating is so hard..." with 110% sarcasm. But enough chatter from me, you want the recipe - don't you?! optional: 1/4 cup maple syrup/honey (if you like things sweet), walnuts, pecans, raisins, mix-ins of your choice. Grease and/or line 6 single serve ramekins/baking dishes/mini springform tins (my favourite and the easiest for breakfast bakes). In a bown, mix your carrot, milk, applesauce, egg whites, cottage cheese, spices and vanilla until combined (and maple syrup/honey if using). In a large mixing bowl, combine your flour, oat flour, ground flax and baking powder. Pour your wet ingredients into your dry ingredients and mix until combined. Bake for 20-30 minutes or until your bakes have cooked through and a skewer inserted removes clean. 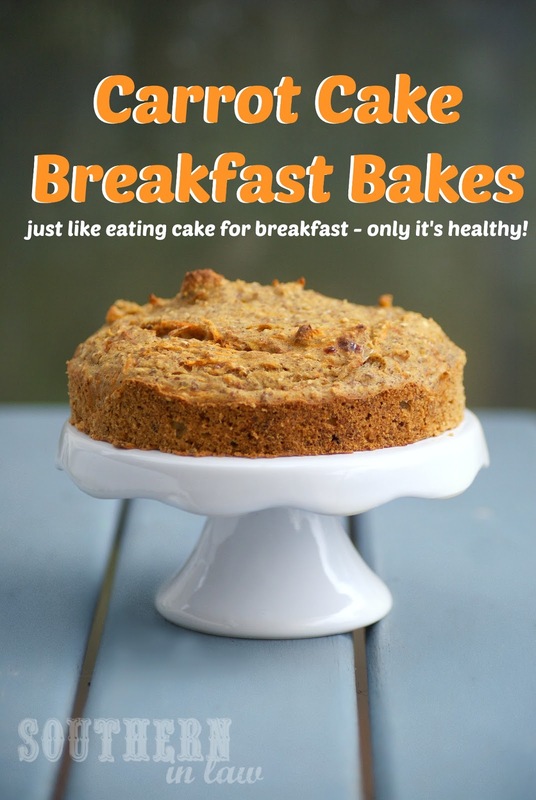 Pssst: I've just been told by my nutritionist friend that these breakfast bakes actually have around 15g of protein in each bake (not including added extras). But tell me, what's your current favourite breakfast? Don't worry that Google Reader is closing, follow Southern In-Law on Facebook, Twitter, Instagram, Pinterest, Bloglovin and Feedly. You can also sign up to Southern In-Law's Weekly Newsletter here. Just like all your baked goods, these look simple and fabulous! 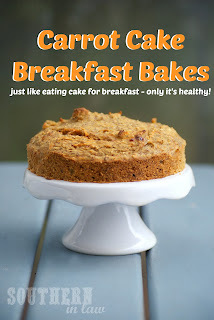 I actually swayed from my regular breakfast bakes (only because I didn't take one out of the freezer last night haha) and had oats this morning and it was so good. Truth be known, I've been eating small bowls of oatmeal as a snack - or having oatmeal for lunch haha. I actually like them cold - so I pop them in the fridge the night before to defrost and by the time I'm ready to eat them they're defrosted! Even easier!